Info Build up Duel Points and score to earn them all at once. Grab items as they appear. Press (or ) to use them. Red Shells will fly towards opponents! Power Sneakers temporarily increase your movement speed. Fire Flowers let you attack your opponent with fireballs. Lightning causes Octus to shoot energy balls. Moto Bugs travel in a straight line. The Shield will protect you from one attack and then disappear. 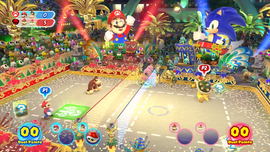 Dual Beach Volleyball is a Duel Event that appears in the Wii U version of Mario & Sonic at the Rio 2016 Olympic Games. This event's guest is Rouge the Bat. The objective of this event is similar to Beach Volleyball where the player on a team of two as to win a certain amount of sets by getting a certain amount of points. The player can choose between having one set or three sets, and the player can choose between each set requiring one hundred, one hundred and fifty or two hundred points to be won. The default settings for this event is one set that requires one hundred points to be won. The event starts with two teams of two with zero points each. One of the players has to serve the ball by pressing twice. After this when a player hits the ball they hit the ball to their teammate who can hit it back to them allowing them to spike the ball, which all require the player to hit . If a player spikes the ball above an emblem on the ground a special effect will occur. If the ball is spiked over a green emblem three balls will be shot with one of them being real, if the ball is spiked over a red emblem the ball will hover over the net before being shot forward, and if the ball is spiked over a blue emblem the ball is shot hovering over a part of opposing team's side before slamming on the ground. During the match there are several Item Boxes that spawn on the court and give the player who touches them an item. Each player can only hold one item at a time. When a player is hit by an opposing team's item a certain amount of Duel Points are added to the opposing team's sub-score. There is a float with two Octuses that, if hit by an item shoot energy balls towards the team that are opposing the team that used the item that hit their float. When a team is hit by these energy balls the opposing team gains several Duel Points that go to their sub-score. Red Shells fly towards opponents when used, Power Sneakers temporarily increase the user's movement speed, Fire Flowers fire a fireball when used, Lightning strikes Octus making them shoot energy balls at the opposing team, Moto Bugs travel in a straight line when used and Shields protect the user from one attack and then disappear. When the ball touches the ground the team on the other side from the side where the ball hit the ground gains all the Dual Points that they gained in their sub-score plus five extra Dual Points for their overall score, their sub-score goes back to zero, and the other team loses half of their Dual Points from their sub-score. After this the team that won the points serve the ball. This is repeated until the required amounts of sets for a team to win are won. This page was last edited on April 3, 2019, at 11:11.